2013 Baroro Watershed Restoration & Public-Private Partnership Launched | FEED, Inc.
August 2, 2013, San Fernando, La Union, The Philippines. 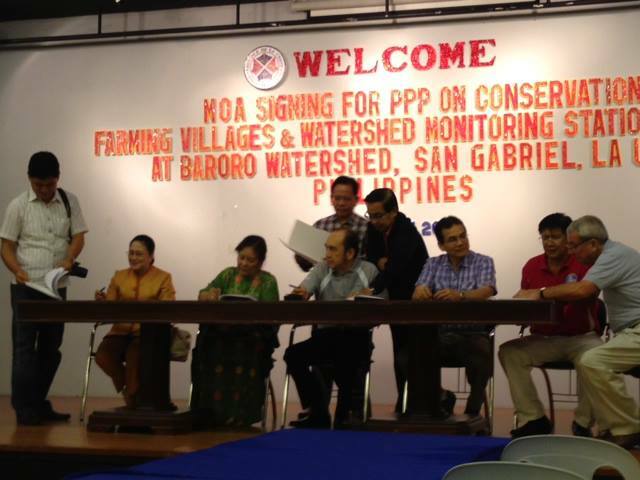 Today marked Region I’s first major watershed restoration project supported by the University of the Philippines, Los Baños (UPLB), the Philippine Department of Environment & Natural Resources (DENR), the Mayor and Town of San Gabriel, La Union, and FEED – launching the establishment of a Community Farming Village and Public Private Partnership geared towards the sustainable restoration of the Baroro Watershed and over 19,000 hectares of land and water resources in the region for La Union province. With the highest percentage of agricultural land in La Union’s District I, San Gabriel is the prime producer of highland vegetables in the province. A multi-stakeholder Memorandum of Agreement (MOA) was signed on August 2 at the San Fernando Provincial Hall, attended by the Governor of La Union Province, Manuel Ortega; Congressman Victor Ortega; UPLB Chancellor Rex Cruz; Mayor Divina Velaso of San Gabriel, La Union; Samuel Songcuan, DENR Provincial Environment & Natural Resources Officer (PENRO); Mrs. Ophie Bakker-Mananquil, FEED Chairman; and their representatives. The establishment of an integrated water resources management system – including the management of vulnerable areas – is aimed to avert the recently projected severe water supply shortages problems in the lowlands, and to counter water and soil erosion – calling for the establishment of forest plantations in degraded areas. Congressman Ortega voiced the concerns of all parties, stating: “We will support this project one hundred percent and make it the best, because we can and because it is possible”. The Community Farming Village (CFV) model has been adopted in various Regions in the Philippines lead by the UPLB and has been proved successful due to its inclusive nature and leadership stemming from local stakeholders who have been and are empowered through capacity building activities, including training in optimal (upland) farming practices and go-to-market business models.